In Thailand the Lahu are one of the main groups categorized as hill tribes and are known by their Shan name Musuh( มูเซอ), meaning ‘hunter’, while in their own language, Lahu means ‘to roast the meat of the tiger’. There are an estimated 60,000 Lahu people in Thailand, located primarily in Chiang Mai and Chiang Rai. Lahu Shehleh (or Musur Na Muey). Where a subgroup name refers to a color, it refers to the traditional colour of their dress. 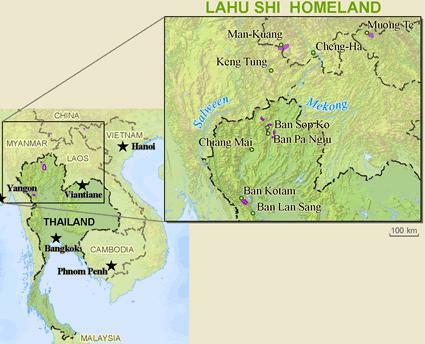 The majority of Thai Lahu belong to the Red Lahu, but there are also Black, Yellow and Shehieh Lahu in Thailand, while many have converted to Christianity the majority are classed as animists (There is no word in the Lahu language for religion and neither does their religion have a name consequently they are described as animists). The majority believe in the existence of a great number of spirits (ne) associated with natural phenomena or deceased human beings. Most spirits are thought to be essentially fickle. Even the spirit guardians of people, crops, and livestock (such as ancestral and locality spirits – Yeh Ne) are seen as easily offended and quick to punish. Some spirits are perceived as invariably malicious. Malicious spirits (those that live outside of the village) are said to “bite” those who offend them, bringing sickness (often of a specific kind) to their victims. Besides such spirits, most Lahu seem to recognize, and frequently give considerable ritual importance to, a supreme and creating divinity called “G’ui-sha” (also called Aue Za) and his wife ‘A Ema’ who is believed to have created Earth. Their spiritual needs of each village are met by a resident To Bo (male) and Ka shaw ma (wife of the To Bo), should they require further help they can call on spirit specialists or others known as shamans usually called Ta la (male) and Ka shaw ma (female), who may or may not reside in their own village. Most traditionalist Lahu communities boast spirit specialists, called maw-pa. They perform propitiatory and exorcist rites and sometimes possess shamanistic characteristics. The Red Lahu are the only known Hill Tribe to build an Animist temple in the confines of their villages, called a Hoe Yae, almost all the Lahu people will adorn their homes with streamers of yellow and white, which are used to ward off bad spirits. The Lahu language belongs to the Central Loloish (or Yi) Branch of the Lolo-Burmese Subgroup of the Tibeto-Burman Family. It has close affinities with the Akha language. Lahu has no traditional script; the people once used notched sticks, with or without chicken feathers attached, to communicate simple messages. The Black Lahu are the most common in Southeast Asia, but all the sub groups use the same standard Lahu dialect. The Lahu people are not just known for their skills in hunting and trapping, they are also widely renowned herbalists, it is not unusual for the Lahu to either offer their services to other hill tribes. Traditionally Lahu children bear no family name, just a first name having two parts. The first indicates whether the child is male (Ca) or female (Na), the second indicating sibling birth order or the animal of the 12-day cycle on which they were born. Thus, Lahu names can sound very repetitive! If a very young child falls sick or cries more than usual, the Lahu believe this to be because the wrong name was chosen — they will then often hold a ceremony just to re-name that child! The Lahu people consider black to be very beautiful and is found in almost all their traditional clothing. This is further endorsed by the Lahu proverb: “Chopsticks only work in pairs”, a person is not considered a proper part of society until he or she becomes part of a pair. Among the Lahu, the most important rite of passage for young people is their wedding. In the wedding the bride and groom are simultaneously initiated into adulthood and obtain the status of ‘Elders (Chaw Mawd)’ all those that are not married are excluded from becoming an elder even if they are advanced in years. The wedding itself has two twinned ceremonies, the first and more elaborate is held in the bride’s home and the other at the bridegroom’s home. Village disputes– While the village elders and village headman will judge a case together it is the headman who will make a final decision. How is a To Bo chosen – The villagers will normally vote for the most appropriate person but will on occasion let a family successor take the post. While the post is for life (they can chose to stand down or they can wait until death takes them), a To Bo who does not fulfill their duties can be fired. Is he blowing that or smoking it ?? "Blowing" and "smoking" are exactly the same thing in Pattaya so I imagine it's the same in the hills. Nice bit of work chitty. Are you an anthropologist or something? I would not want to be bitten by a spirit. Or hunted by these folks. If they can take down a tiger they most certainly could spear the fish. Nice outfits. It amazes me the intricacy of the weaving. Thanks for the info. Last edited by fishlocker; 01-02-2016 at 07:57 AM. Hi newbie here, can't see pics, something I'm not doing?